Local authors of all ages were invited to submit their published works for consideration by the San Diego Public Library. 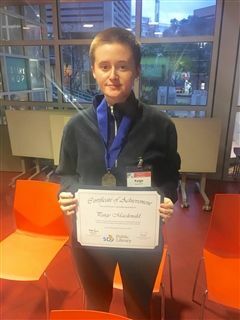 Four local teens' books were accepted, including sophomore Paige Macdonald's Kaya's Undersea Adventure. When she was 12 years old, she wrote and illustrated the children's story about a young girl who goes surfing and gets transported to a beautiful but polluted underwater world. The story is available for sale here with all proceeds benefitting San Diego Coastkeeper.